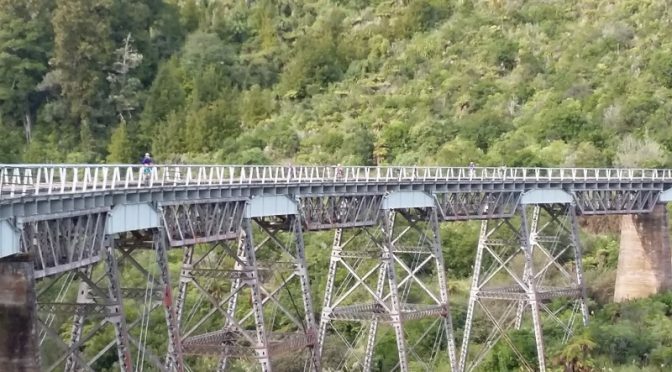 One of my favourite mountain bike trails, possibly for the very achievable distance of 15km and definitely for the stunning views and old bridge relics, is the Old Coach Rd near Ohakune. The trail is generally downhill starting at Smash Palace corner and ending in Ohakune. It follows the old coach road and railway line in places. 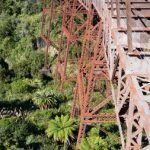 It was the last part of the main Trunk railway line, from Auckland to Wellington, to be completed as the terrain was so tough to build a railway line through. There are lots of information boards along the way showing how hard the rail link was to build. 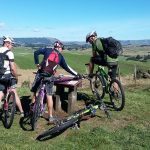 We are lucky enough to have some dear friends, Sue and Raymond, who have a holiday home in Ohakune so when a group of us converged on Ohakune for a catchup, riding the Old Coach Road was an obvious choice for the mad keen mountain bikers in the group. I was just getting back into mountain biking after a break of about 5 years when I didn’t think I had the energy to fit mountain biking into my mum life ( oh how wrong I was ). Bless Raymond who took it upon himself to stay with me at the back and keep me company even though he rides daily around Wellington so is superfit. Raymond had ridden Old Coach Rd many times ( probably both ways making it a 30km ride ) and he was able to point out things of interest and prepare me for any uphills. 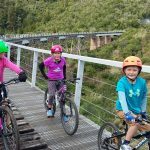 The highlights had to be getting out with our friends, actually riding on the Old Coach Rd cobblestones ( although it was quite bone shaking ) and the amazing Hapuawhenua Viaduct. Not for the faint hearted to ride across this, the height and gaps between the planks totally freak me out and I get sweaty just watching others ride across it. Ohakune is about a 5 hour drive from Auckland so unfortunately we don’t get down there often. And so it was about two years later that we returned for another fun filled weekend away with our friends, our bikes and our children’s bikes. I must admit it was with a little trepidation that I set out with two other mums and 5 kids between us from the start of the trail. 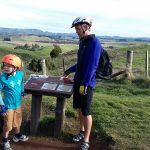 Where were the Dads I hear you ask…such were the logistics that they dropped us all off at the start, near Smash Palace, then drove back to the Ohakune end of the trail and rode in to meet us halfway. So yes I had options, do a longer ride predominantly uphill or ride with the kids and I chose to ride with kids! It’s funny how a hill can seem bigger when you are riding with kids so there was a bit of pushing of bikes but the Dads were actually surprised at how far we had got when they meet up with us. The kids rode very well and were very excited doing this challenge. Our youngest was 6 years old at the time and he nailed it. It was a great day out with all the highlights of the first ride without the bone shaking ride down into Ohakune on the cobbles as they had gravel put over them. The track had been upgraded due to increased popularity. I wasn’t sure how I felt about that from a historical point of view but it sure was easier on the body. 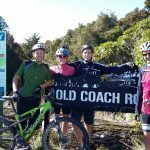 The third time we rode Old Coach Road was the following year, we were lucky enough to be close to Ohakune staying in Raetihi doing the Bridge to Nowhere Ride. The Bridge to Nowhere Ride proved more challenging than I thought ( more on that in another blog ) and after having a pretty full on day riding that I wasn’t expecting to wake up the next morning and feel compelled to ride the Old Coach Road next but I guess that’s how much I love the ride. 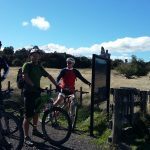 And it didn’t disappoint, the sun was shining and the ride was awesome including the road ride back to Raetihi from Ohakune on the road. If you are in the mid North Island the Old Coach Road it definitely worth a detour! I will leave the specifics of getting there to the Department of Conservation.